I love trees. This has been a beautiful trip for trees. 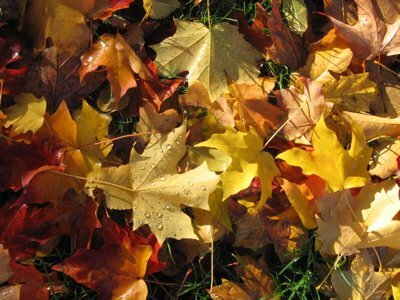 I’ve seen fall colors on them for the first time in five years. Yesterday, though, was a less beautiful day for trees. 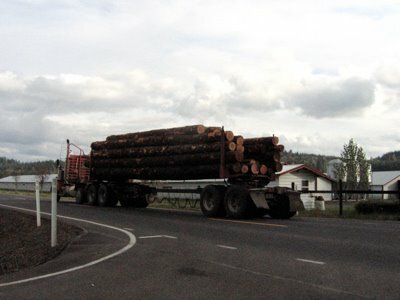 Driving to Olympia from Portland via Mount St. Helen’s, I saw numerous clear cuts and many logging trucks. These things always make me sad. And yesterday I sobbed. Just as I started up the road to the volcano, my ipod (on album shuffle) choose to play “Who bombed Judi Bari?” It is a cd that tells the story of Earth First organizer Judi Bari through her own speeches and songs. This was a very powerful, inspiring, raging, depressing, moving, draining thing to be listening to as I passed the trucks and cuts. I listened to it twice in a row. The corporate logging companies of Northern California have an agenda to clear cut as many old growth trees as possible in the summer of 1990 before the vote that fall on an initiative to protect those old growth trees. 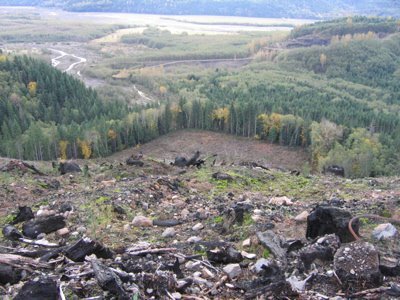 The goal of the logging companies was to make the vote and initiative pointless by making there be no trees left to protect. A note about old growth trees. They’re over 2000 years old, over 30 feet around, and several hundred feet tall. It takes about a dozen people stretched hand to hand to go around one. They are the most magnificant creatures I have ever seen in some of the most sacred habitat on the planet. When they’re cut down, the rainforest turns to desert. The runoff clogs the rivers, kills the fish and creates mudslides that jeopardize the lives and homes of communities at the bottom of the hills. On June 11, a federal jury returned a stunning verdict in favor of Judi Bari and Darryl Cherney in their landmark civil rights lawsuit against four FBI agents and three Oakland Police officers. The jury clearly found that six of the seven FBI and OPD defendants framed Judi and Darryl in an effort to crush Earth First! and chill participation in Redwood Summer. That was evident in the fact that 80% of the $4.4 million total damage award was for violation of their First Amendment rights to speak out and organize politically in defense of the forests. If you would like a copy of the cd, just let me know. I’d be happy to get one for you. There is so much more to the story and I can’t begin to convey how inspiring, dynamic, and vibrant Judi Bari is. This entry was posted in Soapbox and tagged politics, redwoods, work. Bookmark the permalink. The story of Redwood Summer and the bombing of Darryl and Judi is quite a story to be listening to while driving through clearcuts. I know that must have been an emotional journey (in more ways than one). I’ve been choked up enough times driving past the clearcut hills of Scotia (where Pacific Lumber is headquartered) to know how that feels, and that’s without having Judi Bari’s voice echoing inside my car at the same time. Having seen Judi speak many times and having known her a little, I recall how her charisma and her passionate forcefulness came across as she spoke. She was an excellent speaker and organizer. PS> That photo you linked to of Postcard Grove? Here’s yours truly in the exact same spot.